Vandana Khobragade, a small farmer, knew the wheat and chickpea growing on her half hectare farmland needed weeding. But she could not afford to pay Rs 50 a day for labour to farm hands in her village Matkazari in Maharashtra's Nagpur district. She was pleasantly surprised when farm labourers in the village said they would weed her field for free. The weeds growing in Khobragade's land are medicinal herbs bhringraj and gandhprasarani. The women who weed Khobragade's land will make money by selling them to Shri Shail Medifarms, a Nagpur-based firm supplying medicinal herbs. There is an additional income of Rs 5,000 to Rs 6,250 per hectare (ha) per year from what was considered weed till villagers realized there was a value to the plants growing wild in their farms and village common land. 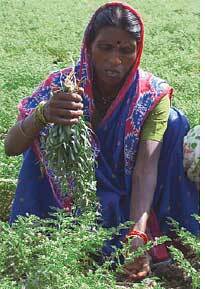 Farm labourers have therefore reduced their wages by half.When small or marginal farmers like Khobragade are unable to hire hands people are willing to weed for free as they get paid Rs 12 to Rs 30 per kg for these dried medicinal herbs. Weeds in these parts acquired commercial value when in 1997, Vrunda Kate, an ayurvedic doctor in Nagpur, set up Shri Shail Medifarms. It buys 30-40 tonnes of herbs from 200 procurers in Nagpur, Amravati and Akola districts of Maharashtra and parts of Madhya Pradesh. During nearly five years of working in rural areas with the health programme of various non-profits, Kate noticed at least 25 species of medicinal herbs grow wild in most villages in Maharashtra. Villagers weed out and burn these herbs. "I had often wondered if only a link could be created between these farms and ayurvedic practitioners, who need pure herbs," said Kate. Deodas Dongre of Nahadi village in Nagpur weeds his 0.2 ha by himself and sells them to Shri Shail. "I used to burn these as weed earlier, but in the past two years I have made a profit of Rs 4,000 from akashvalli, bawchi, bhui-amla, gandhprasarani and atibala herbs. This excludes transport cost," he said. Due to good irrigation, weeds grow in plenty on his field. Balkrishna Dhengre, who grows marigold in Matkazari village, collects about 600 kg of bhui-amla from his 1.2 ha in a year. After deducting labour and transport costs, he makes Rs 2,500 per ha. This is not all. Shri Shail buys the leaves, stems and roots from his marigold plants, helping him rake in another Rs 3,000. Shri Shail has helped 15 landless women from Matkazari form a self-help group that supplies 10-12 tonnes of herbs a year. Sheela Shiwankar, a member of the group, said this assures an income of Rs 45 a day throughout the year. The business of medicinal herbs has led to reduced use of chemical herbicides in Matkazari. "Many farmers used weedkillers due to the prohibitive cost of labour. While manual weeding costs Rs 7,500 per ha in the kharif season, weedkiller spraying costs Rs 3,000 including labour." Since farm labourers started weeding at low rates, 12 farmers in the village have stopped using weedkillers. "Herbicides only kill small plants, not the sturdy weeds," said farmer Shantabai Kuhikar. "It makes better economic sense to have weeding done manually, more so now, even if the total cost is slightly higher." Ayurved medicine companies, too, find it makes more sense to get their raw material from Shri Shail than from individual suppliers. 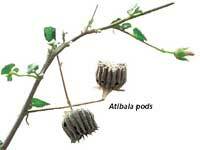 Shri Shail supplies these herbs to ayurved practitioners in Maharashtra and Madhya Pradesh. This was desperately needed, said D M Saraf, a Nagpur-based Ayurved therapist, customer of the firm for five years. "We are always in doubt about the drugs we administer. The ayurvedic drug market is in the hands of traders with little knowledge of herbs," said Saraf. Adulterated and spurious drugs slow down treatment, which is one of the reasons ayurved is not so trusted, he said. Kate now plans to train village women to treat common ailments with simple remedies. She is happy that her efforts have revived traditional knowledge of herbs growing in the area by rediscovering value for the weeds.